As we recently reported on our Boston Personal Injury Attorney Blog, a newly released report pointed out the top 200 most dangerous intersections for bicycle, car and pedestrian accidents in Massachusetts. This report was released to help residents identify and avoid dangerous areas, and to urge state officials to take action to help make these intersections safer. This wasn’t the only recently released report that identifies dangers to pedestrians in the state. The AAA Foundation for Traffic Safety released a report that focused on pedestrian accidents, highlighting the main causes and factors, and providing recommendations to fix the problem. Our Boston pedestrian accident attorneys understand that traffic-related accidents are the number one cause of death for people in the U.S. According to Transportation for America, there were more than 700 pedestrians killed in Massachusetts from 2000 to 2009. These accidents cost the state more than $3 billion. Our state’s Pedestrian Danger Index (PDI) is 24.9, which gives us a poor ranking of 42 out of the 50 states. According to the Foundation, speed is the top contributor to the outcome of a pedestrian-car accident. The faster a vehicle is traveling when it strikes a pedestrian, the higher the risk is for that pedestrian to experience severe injury or death. According to statistics from the report, a pedestrian faces a 10 percent chance of sustaining serious injury when hit by a vehicle that is traveling at 16 miles per hour. A pedestrian faces a 25 percent risk when a vehicle strikes at 23 mph, a 50 percent chance when a vehicle strikes at 31 mph, a 75 percent chance when a vehicle strikes at 39 mph and a 90 percent chance when a vehicle strikes at 46 mph. The risk for death increases with the speed of the vehicle as well. 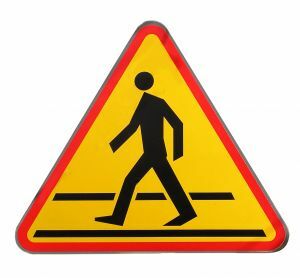 A pedestrian faces a 10 percent risk of death when hit by a vehicle traveling at 23 mph during the time of impact, a 25 percent risk at 32 mph, a 50 percent risk at 42 mph, and a 75 percent risk at 50 mph. These risks vary with the age of the pedestrian. A 30-year-old pedestrian hit by a vehicle traveling at 35 miles per hour faces the same risks as a 70-yer-old pedestrian who is hit by a vehicle traveling 25 miles per hour. -Federal, state and local officials should reduce the speed limits in areas with a large population of pedestrians. -Transportation officials should consider putting up a physical barrier to separate vehicular traffic and pedestrians in areas where a reduced speed limit wouldn’t benefit traffic flow. -Vehicle creators should look into creating better pedestrian-detection systems to identify pedestrians within a dangerous distance from a vehicle and to warn the driver or to stop the vehicle automatically. According to the National Highway Traffic Safety Administration, there were nearly 50 pedestrian fatalities in the state of Massachusetts in 2009. If you or someone you love has been injured in a pedestrian accident in the Boston area, contact Massachusetts Personal Injury Lawyer Attorney Jeffrey S. Glassman for a free and confidential appointment to discuss your rights. Call 1-877-617-5333.